Actors in the building process are critically dependent on a corpus of written text that draws the distributed work tasks together. 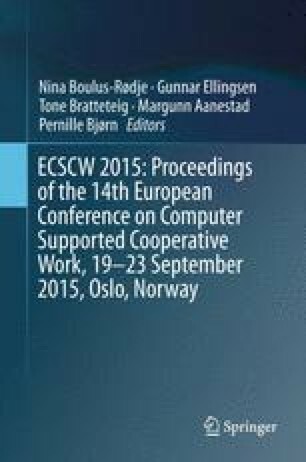 This paper introduces, on the basis of a field study, the concepts of corpus, intertext and intertextuality to the analysis of text in cooperative work practice. This paper shows that actors in the building process create intertext (connections) between complementary texts, in a particular situation and for a particular task. This has an integrating effect on the building process. Several types of intertextuality, including the complementary type, the intratextual type and the mediated type, may constitute the intertext of a particular task. By employing the concepts of corpus, intertext and intertextuality with respect to the study of the building process, this paper outlines an approach to the investigation of text in cooperative work. I am indebted to the people of MT Højgaard A/S and PHIL & Søn A/S for letting me take up so much of their time.